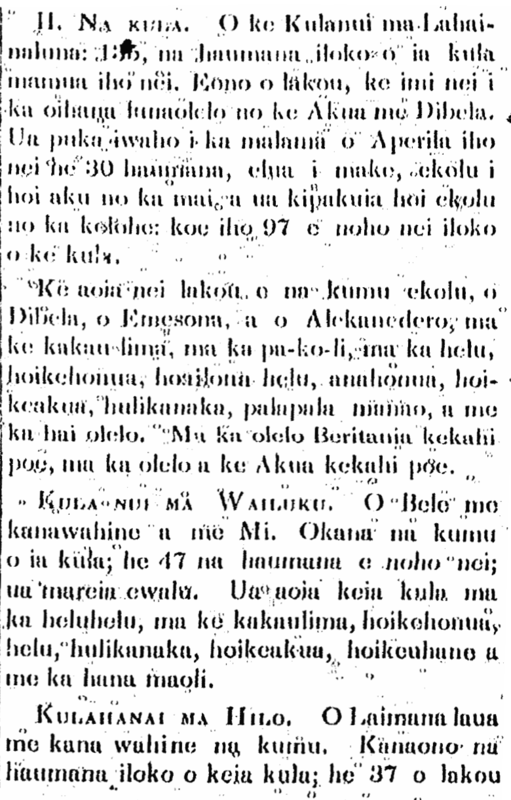 Early story from Joseph Nawahi, 1861. Vote for John B. Enos (Enoka), 1914. As a Republican candidate in the primary election. John B. Enos is one of the candidates running for the position of supervisor [lunakiai] in this election season; he is not a stranger before you, O voting people of this county. He ran as a supervisor candidate in the last season and lost, but that is not something that made him step backwards; your support is greatly sought after in this primary election. He was born in Makiki and educated at Royal School in Kehehuna, and graduated from that school; and he was married to one of the fine blossoms of his homeland, and he is working at his own painting business with only Hawaiian employees. This shows his true Hawaiian-ness, and his love for his fellow Hawaiians. Don’t forget him as the candidate for this coming primary election. Ka Holomua, Buke I, Helu 50, Aoao 5. Sepatemaba 12, 1914. Monument to Kauikeaouli on his 100th birthday, 1914. The Populace Gathers in Kawaiahao on the Evening of this Past Tuesday. It was a scene from the sacred times when the Islands were ruled under monarchs, that was before a great crowd of people which arrived at Kawaiahao Church in the afternoon of this past Tuesday, when a memorial service for the hundredth birthday of King Kauikeaouli, Kamehameha III was held, and unveiled was the stone tablet dedicated to him that will be stood at the place of his birth at Keauhou, North Kona, Hawaii. Before the hour set aside for that remembrance, at four o’clock in the afternoon, the crowd entered the church: from the members of the organizations of this town, the students of the Kamehameha Schools, the heads of the government, to the general public, filled up the church, with some people standing. Outside of the church grounds was the Royal Hawaiian Band entertaining the people, with a majority of the people there, because they could not get a seat in the church.